I used December Sketch 2. 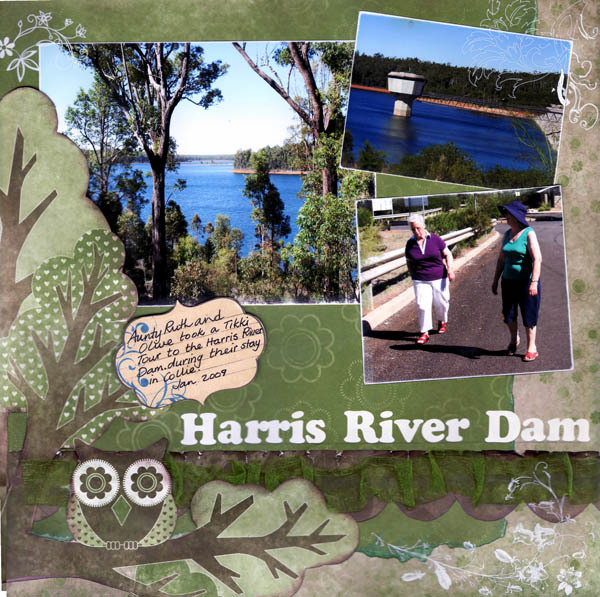 The photos are from a recent visit to the Dam with my MIL and Aunt. I am not used to seeing dams with water in them! Love the pp's you have used. This one supplies drinking water all over the great southern part of WA, and it is just down the road. Wow ...That paper is terrific. Love the white flourishs. Stamps or rub-ons? Marion, the way you have worked these papers looks fabulous and I love the way they make those photos jump off the page. Awesome use of the pp, & the scrunched ribbon is so effective. Just a wonderful layout. Great layout, love the owl in the bottom corner and the stamp/rubon on the photo corners. Well done. Another fabulous LO Marion.. I love that paper. Marion, this looks fantastic and I love that PP you've used. Is it layered?